I'm trying to get back into the habit of a weekly #yarnalong and so I hope you will join me! I kept it up for a little bit after Ginny at Small Things stopped sometime last year, but then let it go when things got busy and it started to feel lonely. I also noticed that my reading, outside of reading to the kids for school!, started to lack and linger. I missed that part of my week, and having a weekly "progress marker" for my knitting (and an excuse to make sure I had just a bit of for fun knitting that I could share! ), so here is my attempt to kick off a "yarn along" again. This week, I did backtrack just a bit. I had finished this piece up over the weekend, but was not pleased with the color work portion. I knew when I started it that I wasn't going to like it, but kept thinking, oh blocking will save it!, it will end up like what I want, but I couldn't shake the, not quite, feeling, and never even made it to blocking. I ripped back last night and started back knitting, this time in a different direction and with a new vision. Much happier this time, and blocking will only make it more beautiful. 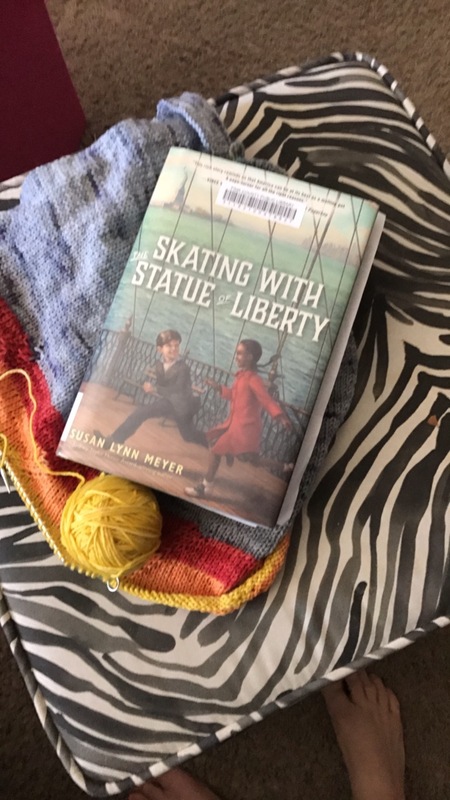 I started reading Skating with the Statue of Liberty, but Susan Lynn Meyer the other week. It's a Children's book that I picked up at the library while browsing with my little ones (can you tell I don't make it out of the Children's section very often, lol? It has been a wonderful read so far, there is something very comforting about reading a Children's book, and it also helps me make decisions about read alouds and helps me when I am preparing lessons for them. I'm not sure if we will touch on this one this year (it is set during WWII and is about a Jewish family that came to America during that time), but it is one I will definitely add to our list. I'd love it you joined in with me and share what you are reading and knitting this week! You can leave a comment, or write your own post and be sure to leave the link in the comments!